What prompts our hostas to wake up in the spring? Most factors are obvious, but some may surprise you. Unlike many frigid regions in the North, the traditional Mid-South hosta parade starts in March. Sometimes these guys and gals poke their noses above ground in late February. In the wake of an unusually mild winter, some hostas have already broken dormancy. For the past two weeks, pips of the usual early-risers have been restless, peeking from undercover to see if they can safely jump out of bed. Jack Frost, you know, may be lurking around the corner. Remember several years ago when he nipped early growth? Most of my in-ground hostas are still snoozing, but recent wet and mild conditions are sure to change that. I expect to see them waving at me before I’m finished clearing those ubiquitous winter weeds. There’s not a whole lot I can do to hold back the hosta parade. Air and ground temperatures play big roles in rousing hostas from their slumber. Once the air warms to a sustained average of 50 degrees and the ground reaches 40, there’s no holding our hostas back. Some delay their arrival because of genealogy, but most join the parade within a couple weeks. Those playing the blues are generally near the back of the procession. 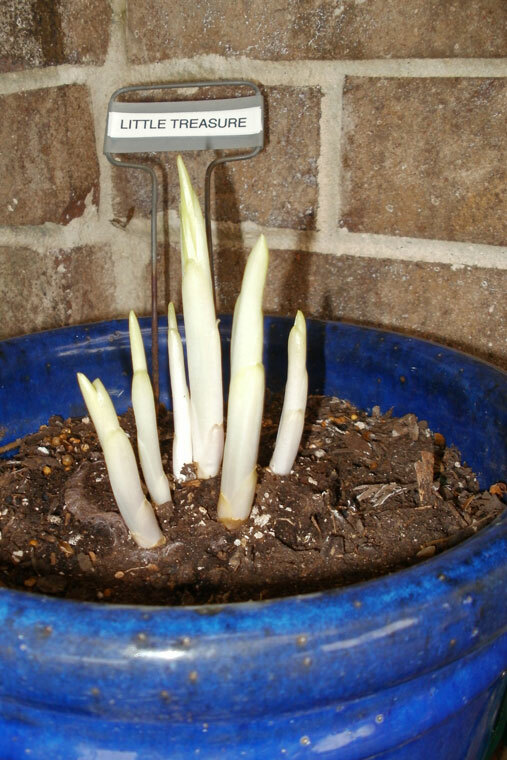 Wind can also coax hostas out of dormancy. A nice warm breeze combined with a little rain can tease those with exposed rhizomatous tendrils and persuade them to hasten growth. While cold winter rains are normal in the Mid-South, they do keep the ground porous and ready for the spring warm-up and eruption of plant life—unlike northern states, where ice and snow tend to keep everything in a deep freeze until the vernal equinox (about March 21, the calendar’s official first day of spring). There’s no question that a stretch of sunny days will warm the ground rapidly. Sunlight is essential to help hostas ring in spring. That’s one reason I park patio pots in my darkened garage over the winter. By putting these potted hostas in cold storage and depriving them of light, I guarantee that they’ll have a longer winter nap and a more energized spring. But I remain awake to their needs. I sprinkle these dormant darlings twice a month to simulate occasional outdoor showers. Another good reason for seclusion is to keep fine pottery from cracking during our typical freeze-thaw-freeze-thaw winters. Imagine my surprise last week when I ventured into the garage and found a hosta desperately stretching its wings. ‘Little Treasure’ was the beneficiary of light leaking through a crack in window shutters. While every other hosta slept, this one reached for the slightest sliver of sunlight. According to my records, it woke up three weeks early. This lance-leafed lovely and other treasures have since been moved back to the patio. While warmth, sunlight, precipitation and wind encourage emergence of hostas, more factors are involved—particularly parentage. Hostas native to southern climates around the world can be expected to show their colors early. That’s why many of our fragrant friends—descendants of the Chinese species plantaginea—lead the parade into March Madness. And that’s why my little ‘Dixie Chickadee’ is already strutting out front.